Evolving aromas of espresso, beeswax, peach jam and chamomile. An energetic mid-palate pairs Seville orange with wet shale and stinging nettles. The finish goes on for miles with minerals and rock dust. Pair this cider with pork of almost any kind, especially cured meats and charcuterie; pizza, especially grilled; and all manner of grilled vegetables. This year’s Albee Hill, more than any other year, is made up of small amounts of many varieties. When people ask how many apple varieties we grow, my response— “40” (I don’t really know exactly)— brings a “wow.” But we never planted all of those varieties with the notion that we needed a little bit of everything to make great cider. It was rather the journey that led to the many varieties in this vintage. 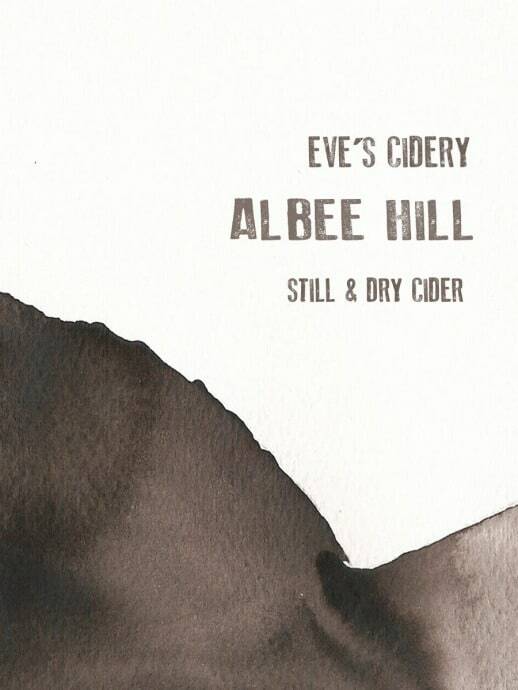 The Albee Hill sites where we grow the apples in this cider have been where we have poured our creative energy and our bodies; it’s been strenuous and it's been rewarding. We jumped onto the wooded site with an enthusiasm that defied logic: clearing the land then planting it without a deer fence, without irrigation, without needed tractor driven implements. The result, in the first few years, was a lot of mortality and a lot of replants. We are continually learning which varieties grow best at our site and how they contribute to cider. As we have replanted and added rows it occurred to us, “let’s try this variety.” Fifteen years is a short window for experimentation when you include the time for grafting, tree growth and fermentation. In 2017, we began harvesting sufficient quantities of many individual cider varieties to make single variety tanks and taste the result. But, at the same time, this Albee Hill is a medley. It makes me think of that evolving orchard. The 2017 Albee Hill is made from the best of our best apples. We made this blend from our Albee Hill Orchard before devoting apples to any of our other blends. Within the orchard, the soil type—Lordstown—varies, with the depth-to-shale increasing as you go down the slope, resulting in drier soil at the lower elevations. This cider reflects our variety choices for the sake of the whole, and the soil variation within the site: it is an assemblage of varieties and site characteristics.